20 megapixels. 8x optical zoom. 16x digital zoom. 28mm wide angle lens. 2.7in LCD . Image stabilisation. Red eye reduction. 720p high definition video capture and playback with sound. Maximum ISO 1600. Intelligent scene mode. Self timer. Built-in flash. Memory card compatibility: SD, SDHC, SDXC, Size H5.4, W9.5cm. Weight 126g. Includes 8gb SD card and soft carry case. Slim and pocket able. 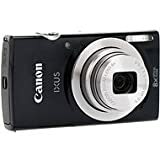 Slim and stylish with point and shoot simplicity, this IXUS puts superb quality and versatility in your pocket thanks to an 8x optical zoom with 16x ZoomPlus, Smart Auto and instant HD movies. Includes carry case and 8GB SD Card. This entry was posted in Discount Photography and tagged 177 20.5 Mpix, Camera, Canon, Digital, IXUS by Ball Photo. Bookmark the permalink.